FORT LAUDERDALE, FL--(Marketwire - Feb 2, 2012) - Unrabble™ (www.unrabble.com), a cloud-computing startup that simplifies and redefines the process of hiring new employees, today announced that it has released a new free version. With the software's most recent update, companies, startups and individuals will be allowed to create a job opening and use Unrabble's robust candidate evaluation tools without paying a subscription fee. "Unrabble is the first solution of its kind to put hiring in the hands of the decision maker and unchain hiring from the traditional paper resume," said Kevin Watson, CEO and co-founder of Unrabble. "By offering a version of our software for free, we're giving busy managers the ability to complete an entire hiring cycle using our solution. We believe that once you use Unrabble's profile-based approach, you won't go back to accepting paper resumes or legacy applicant tracking systems that just track resumes." One of the most noticeable differences in Unrabble's approach to hiring is the complete shift away from the traditional resume to a new generation of on-line profiles. Using Unrabble, job candidates create an interactive profile that details their entire career history instead of e-mailing or uploading a resume. This gives the candidate the opportunity to do things a traditional resume cannot do such as connecting to their social media profiles, integrating video, explaining job transitions, ranking their skills and bragging about their accomplishments. "There's so much more to people these days than what can be summarized in a resume," said Watson. "Unrabble's profile allows candidates to tell their story in a way a resume never could. Unrabble also includes a unique feature called Micro-references that allows candidates to have very specific accomplishments verified by their professional network, thus adding more weight and validity to a person's on-line profile." When the rich profile information flows into Unrabble, hiring managers can easily identify candidates that match their needs. Profiles can be analyzed and researched in ways that previously would have typically required significant time and even phone interviews to accomplish. Unrabble automatically ranks job applicants based on an array of criteria including skills, career preferences, and other specializations to quickly identify the most qualified and best fitting candidates as they apply from multiple sources. As a result, hiring managers no longer have to spend countless hours reviewing bad resumes. Unrabble makes it easy for hiring managers to create a new job posting, instantly broadcast the job to social networks and job sites such as Indeed, StartUpHire and SimplyHired.com, communicate with candidates and include co-workers in the hiring process. Managers can communicate with candidates using built-in messaging functionality that eliminates the need to make redundant phone calls or disclose e-mail addresses and phone numbers. Colleagues can easily view, comment on and rate candidates so that hiring managers can reach a quick consensus. Unrabble is available for free at www.unrabble.com. The free version can be used for one open position at a time. Customers that need more than one position or wish to use enhanced functionality such as job board integration and a branded landing page can upgrade their account starting at only $29 per month. The Pro Version, which features additional functionality such as colleague collaboration and a multi-positions career page, is priced at $49 per month. 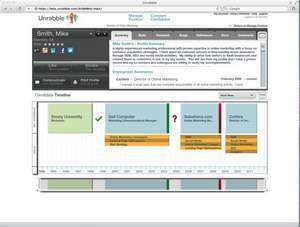 Visualize your ideal candidate with Unrabble's interactive career timeline.